It’s hard to imagine that the Daleks have been around since 1963! Now, to capture some of the interest in the new Dr Who episodes, these super-looking remote-controlled models have been released. For those of you who don’t know, the Daleks are a race of mutants who live in these robotic shells. The shells themselves feature formidable weaponry, but despite the Daleks’ ruthlessly-determined efforts, they were never able to outsmart the Doctor – mainly because they famously couldn’t climb stairs. I never missed an episode of Dr Who, and I would have sold my soul for one of these things as a boy, but after the bitter rivalries between the Daleks’ creator, Terry Nation and the BBC, the commercial merchandise was withdrawn. It looks like Terry Nation’s passing and the popular success of the new series has spurred sort of deal to be made. 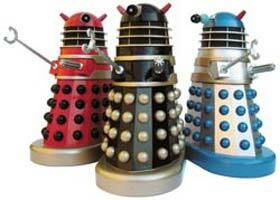 These Daleks stand 8 inches tall and can be moved by rotating left and right, as well as forwards. The head twists, just like the “real” cyborg, and you can play a random, digitised sound from a list of 9 different phrases, and of course the beloved “You will be exterminated!” is included. The Daleks cost $55 and come in three different colour schemes, but it’s pot luck on the colour choice, though I’ve no idea why! In any case, I’m ordering a Dalek (for my son), but it’s going back it’s not a red and black one! The remote-controlled Dalek from Think Geek.